Wednesday night was our sixth Cooking for a Cause event, run by our Helping the Hungry commission. The commission cooks for the needy in our community on Wednesday nights, after school. This week our students learned how to make meat sambusak. Students learn to prepare a variety of entrees, dinners, and desserts while participating. All of the food prepared in these events are sent to needy families who can then enjoy delicious homemade dinners. Special thanks to our Commissioners Hiram Haddad, Susie Sasson and Florence Dweck. A very special thanks to our chef Ms. Sarah Harari, mother of students Aaron and Joy Harari. On Rosh Chodesh Adar, this past Friday morning, our students participated in a special Purim program. The program consisted of rikkudim, and a Senior Masquerade, where the seniors delighted us with their creative and colorful Purim costumes. We truly brought in the month of Adar with Simchah! 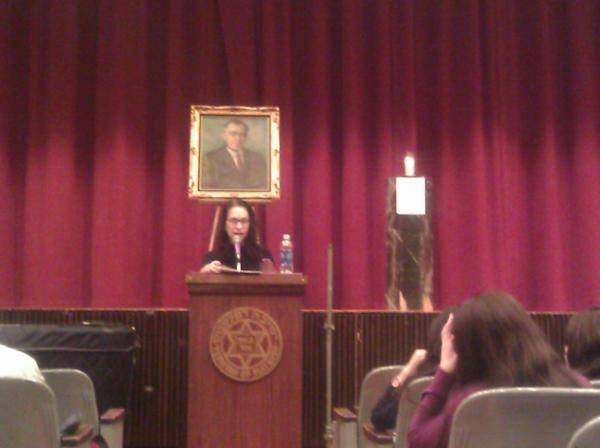 Scholastic Writing Award Goes to Flatbush Student for a Second Time! We are very pleased to announce that Sophomore, Joy Feinberg, has received a remarkable recognition by the Casita Maria Center for Arts and Education. She has been chosen as the recipient of both the Gold and Silver Keys from The Scholastic Writing Awards of 2012 in the New York City Region. This is the second time that Joy has won this award following her Gold Key award last year. This year she was awarded for her personal essay as well as her short story. This is a remarkable achievement and milestone in her creative endeavors. Panels of writers, editors, educators, and creative professionals selected the Awards recipients as the most original submissions by New York City teenagers. Joy's work was one of 108,500 nationwide submissions. We are so proud and wish Joy the best of luck in the national competition. On Tuesday, February 14th, in conjunction with SAFE, the Yeshivah of Flatbush High School had the privilege of having guest speaker, John Nichols, visit the school. John delivered a powerful message to the students in grades 10-12 about the dangers of smoking cigarettes. John began by providing a personal account of his battle with addiction to smoking; recounting details of how his addiction developed and affected his life. Both students and faculty felt the impact of John’s message, as he discussed the physical and emotional toll of his ongoing fight with lung cancer; including his inability to eat, drink and speak normally as he no longer has a voice box and is now forced to breathe through a stoma in his neck. Students were riveted by the intensity of the message and were also provided with vital information regarding the biological effects of smoking tobacco. Many of the students described the program as extremely powerful and influential. It has inspired and educated many students on when and how to take action against smoking in their lives, along with how to help friends and family. 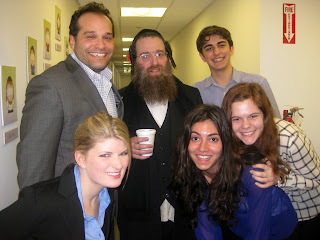 At the Yeshivah of Flatbush Joel Braverman High School all students attend weekly classes taught by SAFE instructors. The instructors provide our students with health education, as well as, discuss strategies on how to overcome the challenges students might be facing during their high school years. From last Sunday to Tuesday, February 5-7, fifteen Yeshivah of Flatbush students participated in Yeshiva University's National Model United Nations (YUNMUN). Over 60 schools participated from 3 continents and Flatbush won first place for best delegation. 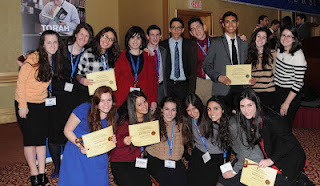 Special recognition goes out to the honorable mention winners: Joy Fienberg and Jonathan Zahavi and the best delegate winners: Rachel Beyda, Norman Greenberg, Michelle Sabbagh, and Isabel Fattal. The Yeshiva University National Model United Nations (YUNMUN) is a student-run simulation of the workings of the real United Nations that gives students an opportunity to experience and learn about the complex landscape of international diplomacy. Playing the roles of delegates to actual United Nations member nations, participants represent a variety of positions, often ones with which they may not agree. In advocating for a given country, students must conduct thorough research of that country's interests and policies across a wide range of issues and concerns, adding both to their knowledge of world affairs and to their appreciation of and facility with research, preparation, communication and critical evaluation. 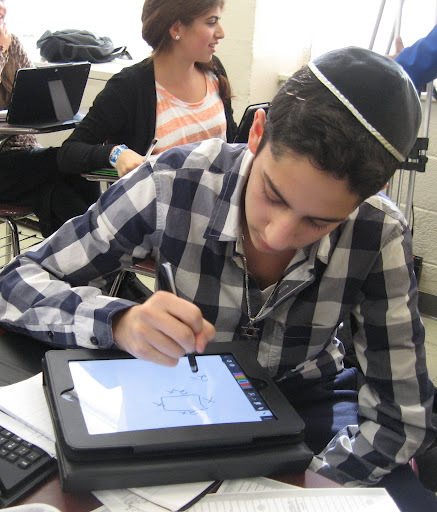 Our 1:1 iPad initiative was recently featured on a couple of websites as well as on the news. For more information about our pilot program read our news release here: iPads for 60 High School Freshmen as Pilot Program Begins. Ari Zoldan, CEO of Quantum Networks and Deanna Gillen, Editor for TRNS pose with our students Ariel Aiash, Sharon Grossman and Michelle Sabbagh. As part of our Pathfinders Program, some of our students had the opportunity to begin work at TRNS and Quantum Networks, under the auspices of CEO Ari Zoldan. Our Students began their internships over winter vacation, writing articles for Talk Radio News. Our Students are looking forward to continuing their work with Mr. Zoldan and his companies throughout the year. Last week, we had a special ceremony dedicating our brand new student lounge in memory of Solomon Dwek, A’H. After a Delicious Lunch catered by Pauline Dushey and Seudah, We were treated to some very special speakers, including Rabbi Harari, Rabbi Besser, Audrey Dwek, Hymie Chera, Sylvia Dwek and Joyce Silverman. Special thanks to all of our Sponsors and all who attended this event. Our students are loving the new lounge and enjoying spending some of their time in this newly updated, trendy hangout spot on campus.